This website is devoted to the scientific and software activities of the quantum Monte Carlo (QMC) group of Toulouse, France. The grand objective of our project is to make of QMC an alternative and efficient tool for electronic structure in chemistry. Our group -- headed by Michel Caffarel -- is located at the Laboratoire de Chimie et Physique Quantiques, CNRS and Université Paul Sabatier. June 2014: QMC=Chem was selected for a meso-challenge on the new CALMIP system EOS. 12000 cores ran for 48 hours. November 2012: Our results were presented for the 5 years of GENCI (Paris). July 2012: QMC=Chem was presented at the VECPAR 2012 Conference, Kobe. June 2012: QMC=Chem was presented on the Intel booth at the International Supercomputing Conference 2012, Hamburg. Dec 2011: Two structures of a beta-amyloid involved in Alzheimer's disease were simulated on Curie (TGCC, France) with QMC=Chem using up to 76 800 cores. 38.5% of the peak performance of the machine (960 TFlops/s) was obtained. 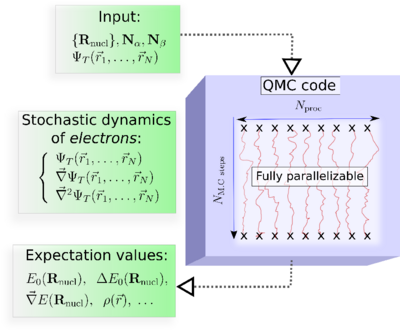 Quantum Monte Carlo (QMC) is a set of probabilistic approaches for solving the Schrödinger equation. In short, QMC consists in simulating the probabilities of quantum mechanics by using the probabilities of random walks (Brownian motion and its generalizations). During the simulations each electron is moved randomly and quantum averages are computed as ordinary averages. Input: The molecular geometry, the number of electrons, and an approximate electronic trial wave function, ψT, obtained from a preliminary DFT or ab initio wave function-based calculation. At each Monte Carlo step : The values of ψT, its gradient, and its Laplacian calculated at each spatial configuration (r1,r2, ...,rN). Output: Quantum averages as ordinary averages along stochastic trajectories. Key property of QMC : Fully parallelizable.. This property could be critical in making QMC a successful approach. QMC an alternative to DFT or post-HF methods ? In practice, both DFT and post-Hartree-Fock approaches and their numerous variants rely on solving (very) large linear systems using iterative algorithms, where the finite dimension of the eigenvectors may become very large and is limited in practice to a few billion of components due to the finite aspects of the hardware. 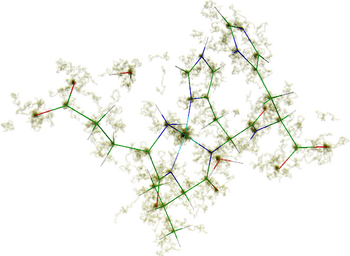 Because of such a mathematical structure, present intensive simulations of computational chemistry are characterized by i) the need of important computational resources both in terms of CPU and central memory requirements, ii) massive I/O, and iii) unavoidable frequent communications between processors. As a consequence, the algorithms are by their very nature extremely difficult to parallelize. Although computational chemistry is very present on HPC platforms as illustrated above, it is difficult to envision how standard algorithms could take advantage in the near future of massively parallel platforms (exascale) and cloud computing. The fully-correlated N-body electronic problem is replaced by an effective one-body problem. Only approximation: Choice of the effective (exchange-correlation) potential, a point leading to various levels of accuracy (local DFT, gradient-corrected DFT, hybrid DFT, etc...). One-body framework particularly attractive for interpreting electronic processes in a simple manner using one-electron pictures. Computational effort of DFT has a very good scaling, of order <math>O(N^3)</math> where N is the number of electrons. The various exchange-correlation potentials developped have now reached an accuracy allowing reasonable quantitative results, even for (very) large molecular systems. Limitation: Strong limitation of DFT: the error made is not controlled and there is no known procedure to reduce it in a systematic way. Popular versions: MP2, MPn, CCSD(T), CI, MRCI, etc. In contrast with DFT: Error much more easy to control but price to pay very high (defavorable scaling). Method easy to implement and having a very favorable scaling, typically <math>O(N^3)</math>. Unlike DFT and post-HF methods, QMC ideally suited to High Performance Computing (HPC) (very modest central memory requirements, very limited input/output flows, codes perfectly parallelized). The only systematic error left -the fixed-node error- may have an important impact when differences of energies are considered. The heavy compensation of errors at work in both DFT and post-HF schemes is much less effective in Fixed-Node QMC calculations. No general and robust algorithm for computing forces in QMC. No simple and systematic way of constructing complex trial wavefunctions of good quality without massive parameter reoptimizations. No "black-box" way for QMC. This page was last modified on 13 July 2015, at 13:45.